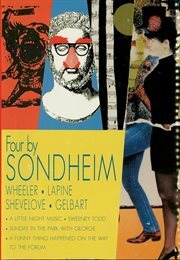 The item Four by sondheim, Unknown, (ebook) represents a specific, individual, material embodiment of a distinct intellectual or artistic creation found in Charlotte Mecklenburg Library. The complete book and lyrics with set and costume designs, production photos, essays, cast lists and credits, awards for major productions, selected discographies, and much more! Includes the shows A Little Night Music , Sweeney Todd , Sunday in the Park with George and A Funny Thing Happened on the Way to the Forum . A richly illustrated Sondheim treasury!